This recipe was originally posted April 2013. Pictures and text have been updated. When I revisited this post to update it with new pictures and read what I had originally wrote, I hung my head in shame. Not just for the writing (although that was pretty embarrassing too...), but because the whole post was all about how healthy green leafy vegetables are. As if this is a thing people were not aware of. Back when I started my blog, I thought the way to inspire people to eat healthy was to share cool things about how food nourishes your body. Before (happily) clicking delete on the text accompanying this post, it was me rambling on about the health benefits of different types of greens. Guys, the nutritional differences between kale and chard and collards and arugula are practically non-existant, and knowing them makes literally no difference in the big context of your health. In my still slightly warped by "clean eating" mindset, I thought that this was a positive approach to healthy eating. And certainly, compared to encouraging people to diet and restrict and give up their favorite foods, it was. But I was still missing the mark. When we focus too much on how "good" certain foods are, it's all to easy to label other foods as "bad." I relied on this "food as medicine" approach in my writing for waaaaayyyy too long, mostly out of habit. It's a big reason I felt kinda bleh about this blog for a period, because I had zero desire to ramble on about why you should eat chickpeas. While I think the occasional bit of research about a specific food or nutrient is interesting, especially when it's about something people often consider "bad," I try to focus on other things, like why I love a certain recipe I'm sharing. I don't want my writing to make it seem like individual foods have magical, curative powers. Because they don't. So, on that note, I love this recipe, not because of the nutrients in the green leafy vegetables, but because it's so incredibly simple and tasty. 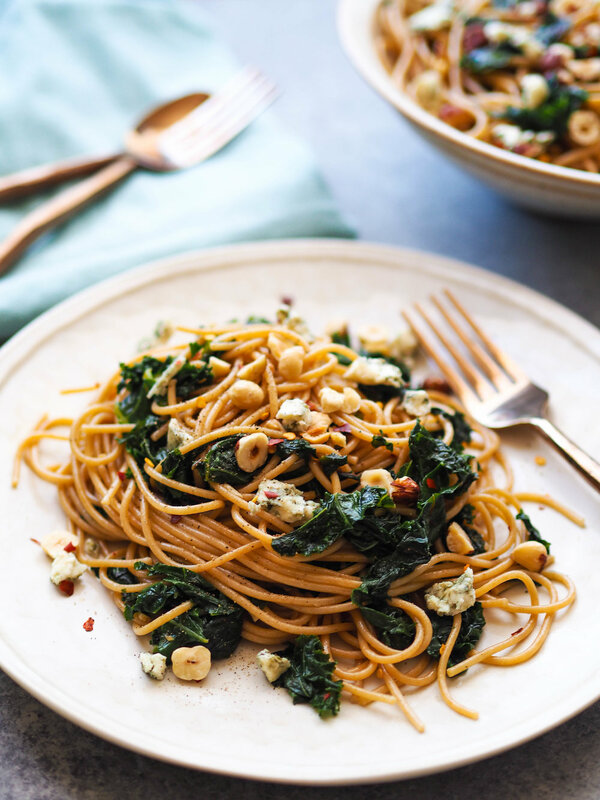 All you do is boil water and saute some greens, then toss it with nutty toasted hazelnuts and crumbles of really high quality gorgonzola. For something that's essentially 6 ingredients, it's got tons of flavor. Feel free to use different types of nuts and cheese, especially if you've got something else on hand. 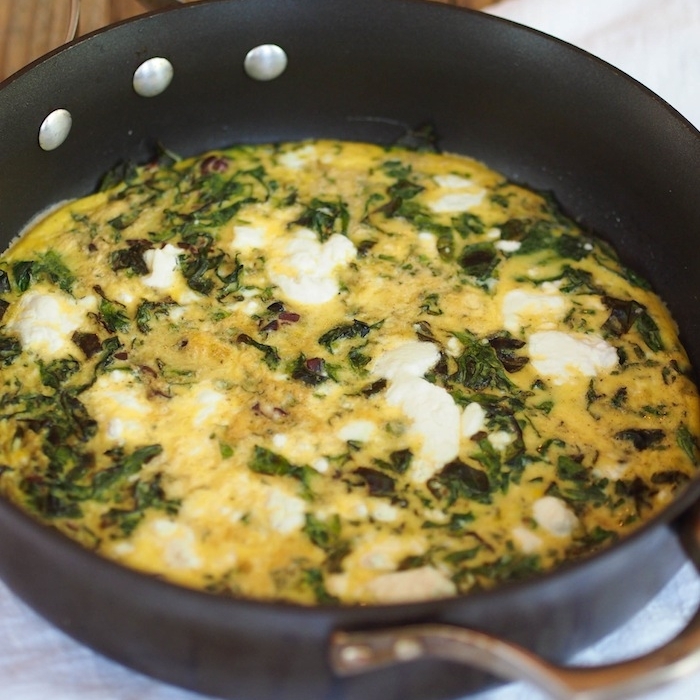 This would also be great with almonds or walnuts, and for cheese, feta or goat cheese. Cook the pasta according to package directions in a large pot of salted boiling water. Reserve 1 cup of the starchy cooking water before draining. Meanwhile, heat the olive oil in a large skillet on medium-high heat. Add the garlic and red pepper flakes and cook 30 seconds. Mix in the greens in batches, using the thicker greens first, then adding more delicate greens as it cooks down. Cook until tender, about 2-8 minutes depending on what type of greens you are using. You may want to add 1/4 cup or so of water to help steam thicker greens. Toss the pasta into the greens. Add enough a little bit of cooking water to make it saucy, starting with about 1/3 cup. Divide pasta between bowls or plates. 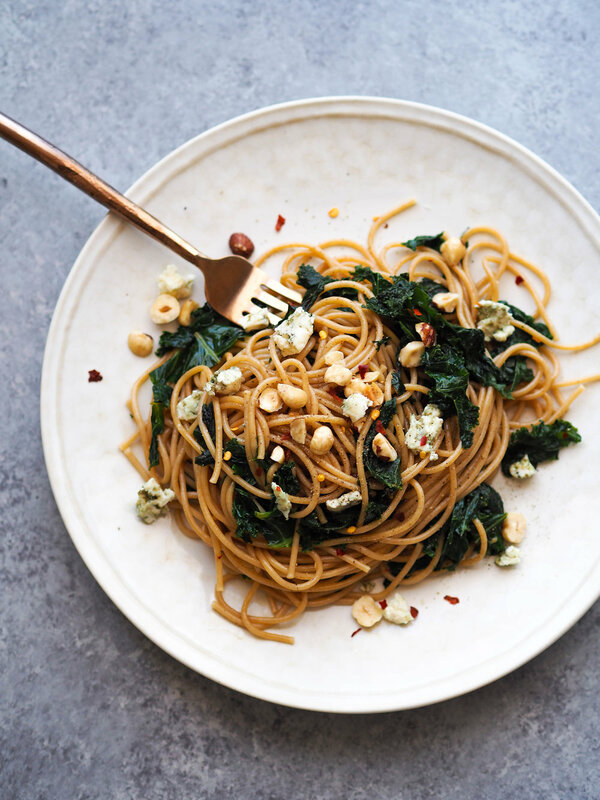 Sprinkle with crumbled gorgonzola and hazelnuts.